At the SIHH 2018 Vacheron Constantin launched a new collection family, called the Fiftysix. The launch pieces consisted of a date model, a day-date/ week, and a complete calendar watch, all of which were launched in stainless steel or pink gold 40mm cases. For an introduction to these pieces, click on that link. Later in the year, they added tourbillon into the mix. 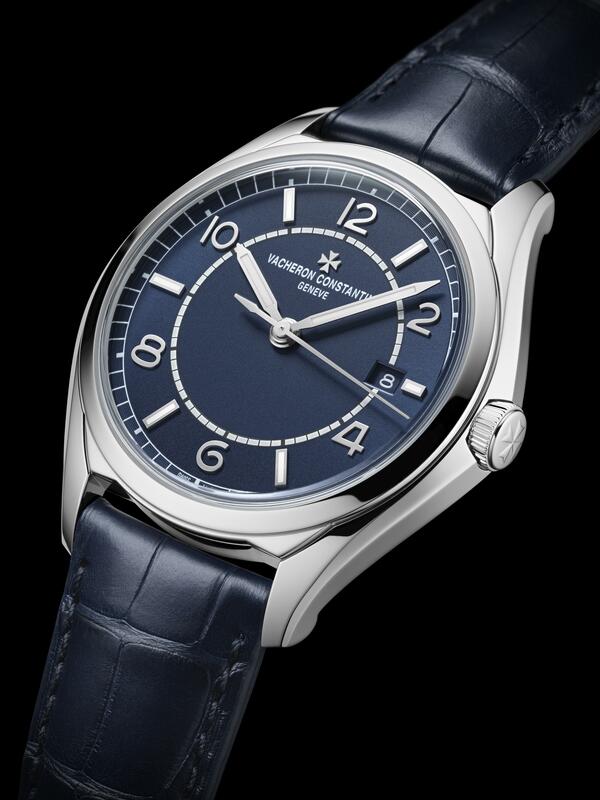 Now, there is the inevitable addition of a new colour, which Vacheron are calling ‘petrol blue’. Not so many posts ago, I was wondering if there was a blue trend happening or whether it was just me. Based on what came out of SIHH, it might not just be me. A boon for lovers of blue dials, with a multitude of shades and tones from which to choose. The two pieces that have been chosen to launch this new colour variant are the date model and the complete calendar. The specifications are the same as the earlier models, so you can read about them there, but let’s start with the automatic time and date model, pictured above. In a 40mm stainless steel case, the petrol blue dial has an opaline centre, sunburst exterior, and the baton hands and white gold markers are coated with Super-LumiNova. Inside, it contains the automatic Calibre 1326, with a power reserve of 48 hours. This movement is based on the Cartier1904-PS MC and produced by Richemont’s Manufacture Horlogère ValFleurier, but finished, assembled, and regulated by Vacheron Constantin. The new Fiftysix complete calendar is also in a 40mm stainless steel case. Functionally it has, as the name indicates, the date, day of the week, and month, along with a moon phase (122 years of accuracy) at the bottom of the dial, in a sector format. 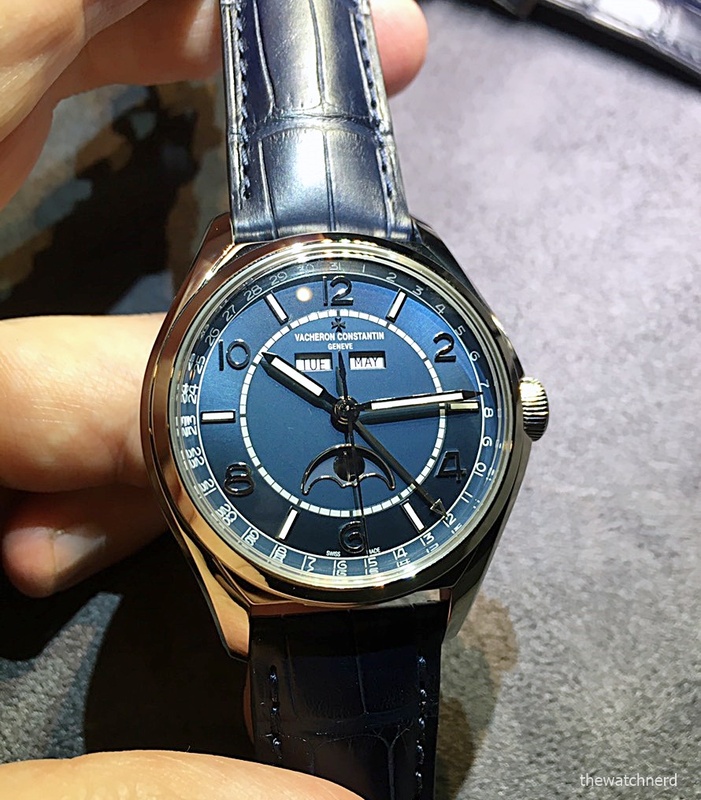 The blue dial also has the same opaline centre and sunburst outer. The numerals, hour markers and moon are all 18 carat white gold, and filled with Super-LumiNova. Movement-wise, it also has the automatic Calibre 2460 QCL/1, which was launched for the Fiftysix collection. This time with a 22 carat pink gold oscilating weight. It beats at 28,800VPH and has a power reserve of 40 hours. Both of the new pieces come on blue Mississippiensis alligator straps with calf inner shell, and on stainless steel folding clasps with the Vacheron Maltese crown.